Treat yourself with an extraordinary trekking crossing the Andes Mountain Range by beautiful valleys between the highest peaks of the Andes. This unmissable expedition starts in Argentina and finishes in Chile. It is one of the most spectacular trekking in the world, and one that shall not be missed! You will be accommodated at camping tents for the first 4 nights and 1 night in a complex of cabins in Cajon del Maipo. registration are carried out before the authorities of the National Gendarmerie. At noon, you will get a lunch box type lunch. In the afternoon, in the Scaravelli Refuge (called Real La Mula Muerta), you will prepare the camp to spend the first night in the mountain range. Dinner and stove. Breakfast and enlistment of the horses to follow the route. This day you will climb El Portillo Argentine, ascending to 4380 meters to continue to the Valley Tunuyán River, where you rest after a demanding crossing. This day is the most extensive and the most demanding of the expedition (8 / 9 hours approximately). When the night comes, you will enjoy an energizing dinner that will surely be adorned by the experiences of this day of adventure. The third day will be destined to rest. You can choose to stay in the vicinity of the camp or take a reconnaissance trek accompanied by the guide, identifying native flora and fauna. In the afternoon, riding on horseback you will visit the Laguna de Los Patos, and return to the camp. Dinner and overnight in tent. After breakfast, you will start the Tunuyán river crossing. The ride continues to the viewpoint of the Tupungato volcano and then, following the Palomares river, to El Caletón or Piedras Coloradas. In this place you will set up the camp to share a dinner in the light of the stars. Night in tent. Departure towards the Argentinean / Chilean Border. Another big challenge lies ahead on the fifth day. Departure to Step Piuquenes to 4030 meters, boundary between Argentina and Chile. At noon you will enjoy a unique lunch at the border marker. In the border, you have to change the mules who carry loads (they are prohibited cross the border). New Chilean mules and Chilean muleteer guides will lead you going down to the river El Plomo in Chilean territory, the final leg of the expedition. After crossing the river, private vehicles are waiting for you. Transfer by minibus to the Cajon del Maipo, coasting the Yeso dam to San Gabriel Village where are the customs formalities where you complete customs paperwork at the police office. After 11 kilometers from the customs office, you will get to the accommodation in a beautiful complex of cabins and farewell dinner at local restaurant. Waypoint: Piuquenes pass 4030 meters. Crossing the river Yeso. End in Parque del Yeso or Termas del Plomo 3000 meters. After breakfast, transfer to Santiago de Chile. Leave the group of Expeditionaries in the bus terminal Alameda. This horse riding holiday will take place in Andes mountain range in Argentina and Chile. Personal expenses such as telephone calls, tips, laundry, etc. 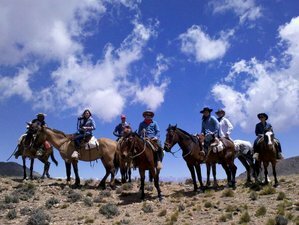 Trekking Travel is a company of horseback riding holidays and expeditions in the Andes Mountain Range, Mendoza, Argentina.